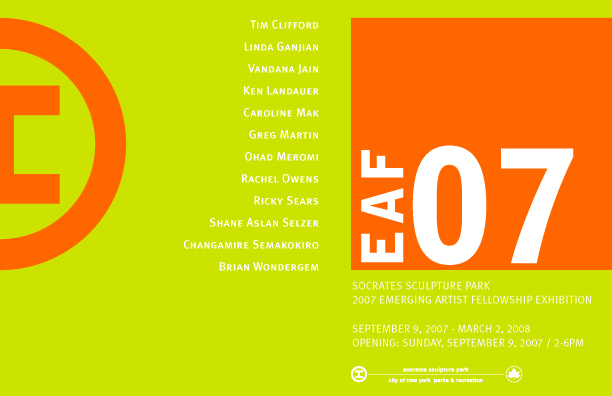 Socrates Sculpture Park is pleased to announce the opening of EAF07: 2007 Emerging Artist Fellowship Exhibition. This annual show features new works by the Park’s current resident artists: Tim Clifford, Linda Ganjian, Vandana Jain, Ken Landauer, Caroline Mak, Greg Martin, Ohad Meromi, Rachel Owens, Ricky Sears, Shane Aslan Selzer, Changamire Semakokiro, and Brian Wondergem. EAF artists are selected through an open call for proposals and are awarded a grant and a residency in the Park’s outdoor studio. Fellowship artists are also provided with technical support and access to tools, materials and equipment to facilitate the production of large-scale public sculptures for exhibition in the Park. The fellows develop their projects throughout the summer in the open studio and on site in the landscape, offering visitors the opportunity to experience both the creation and presentation of their works. Representing a broad range of materials, working methods and subject matter, the diverse sculptural works in this exhibition are presented against the Park’s spectacular waterfront view of the Manhattan skyline. This exhibition is made possible by the dedication and support of our volunteers and friends and by the generosity of: Altria Group, Inc.; Lily Auchincloss Foundation, Inc.; Milton and Sally Avery Arts Foundation; Carnegie Corporation of New York; The Cowles Charitable Trust; Elaine Dannheisser Foundation; The Dedalus Foundation; Mark di Suvero; Foundation for Contemporary Arts; Maxine and Stuart Frankel Foundation; Hugh J. Freund; Agnes Gund and Daniel Shapiro; Harpo Foundation; The HWG Fund, Inc.; Jerome Foundation; The Peter T. Joseph Foundation; Gabrielle and Herbert Kayden; Richard and Ronay Menschel; Ivana Mestrovic; National Endowment for the Arts; The New York Community Trust; Ralph S. O’Connor; Brooke Kamin and Richard Rapaport; The Ross Foundation; Rev. Alfred R. Shands III; Mr. and Mrs. Thomas Smith; Starry Night Fund of Tides Foundation; Ursula von Rydingsvard and Paul Greengard; The Andy Warhol Foundation for the Visual Arts. 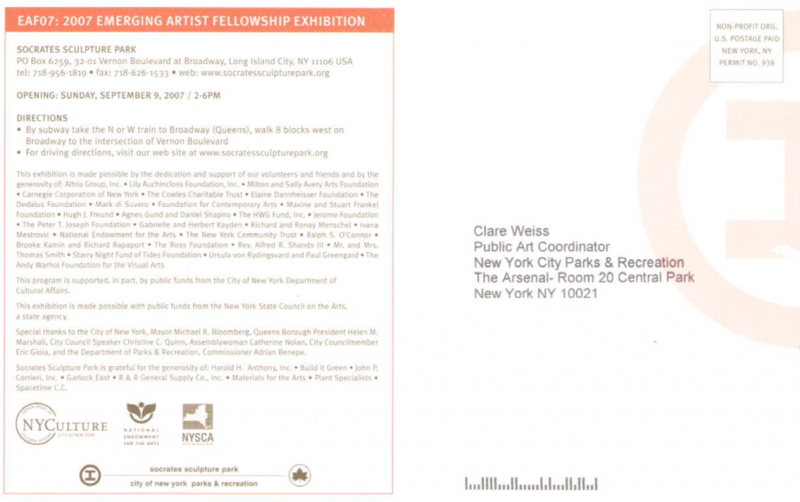 This program is supported, in part, by public funds from the City of New York Department of Cultural Affairs. This exhibition is made possible with public funds from the New York State Council on the Arts, a state agency. Special thanks to the City of New York, Mayor Michael R. Bloomberg, Queens Borough President Helen M. Marshall, City Council Speaker Christine C. Quinn, Assemblywoman Catherine Nolan, City Councilmember Eric Gioia, and the Department of Parks & Recreation, Commissioner Adrian Benepe. Socrates Sculpture Park is grateful for the generosity of: Harold H. Anthony, Inc.; Build it Green; John P. Corrieri, Inc.; Garlock East; R & R General Supply Co., Inc.; Materials for the Arts; Plant Specialists; Spacetime C.C.